Carolyne Kardia studied at St Martin's School of Art and then at the Royal College of Art, receiving her MA in sculpture in 1977. She also completed a postgraduate at Hertfordshire College of Art in Art and Psychology. On leaving college she exhibited with the Felicity Samuel Gallery in Savile Row having her first one person exhibition in 1978. Her early work took the form of sculptural installation with cast components making specific response to the architectural features of the gallery space. She subsequently completed a varied sequence of installation works in different spaces in London including Beaufort Gardens, the Architectural Association and Central St. Martins, London. During her career she has taught regularly at various institutions including Maidstone College of Art, Winchester College of Art and Central St. Martin's School of Art. She currently runs art groups in Dorset and in London. She began working in colour in 1987 and has continued developing the use of pigment in varying ways. "The colours aim to speak of themselves, to be dissociated from their method of application and soar above themselves but equally they are rooted in the materiality of pigment and surface." 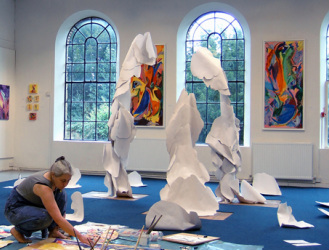 In 1997 she had an exhibition at the Meeting House in Ilminster, Somerset, where she made a large plaster installation in the Presbyterian Hall there and exhibited a selection of 40 paintings and works in pastel and pigment in the upper gallery. In 1998 she made a sculptural installation in plaster at the Town Mill in Lyme Regis, Dorset, this involving working for several weeks in the gallery space prior to the exhibition; during the same year she also showed 20 of her large canvases in the Allsop gallery in Bridport. In 2000 Carolyne made a sculptural installation and showed paintings at Stoke Abbott as part of the Dorset Art Weeks and she had two one person exhibitions of her paintings in Germany. Her 2002 European exhibition of plaster installations and paintings was held at the Max-Planck-Institut, Berlin. Carolyne's UK more recent exhibitions to date include Dorchester Museum, as part of Dorchester's Summer festival, at the Rope Store Studio Gallery in Nailsworth near Stroud, and The Blyth Gallery in Manchester and very recently Sherborne School, Dorset. Last year she showed 40 paintings at St Pancras hospital and built a sculpture installation on site in the conference centre there. She has also worked at Jules Thorn Day hospital for almost twenty years running a therapeutic ceramic/pottery group.